We all have something we love most about the holiday seasons from comfort food and treats to the warm glow of lights on a great-smelling fresh-cut tree. With all of the fun decorations and festive cuisine, there is bound to be an accidental spill or need for cleanup somewhere. We have put together a list of common holiday messes and tips for cleaning them up so you can continue on with your Merry and Bright. Classic red and white striped peppermint, bright colored cherry, hot pink bubblegum– candy canes come in a large variety of flavors and colors now a days. These yummy holiday lollipop alternatives can create quite the sticky situation. For candy cane mishaps on clothing, soak the item in cold water and a tablespoon of white vinegar for 30 minutes before washing as usual. 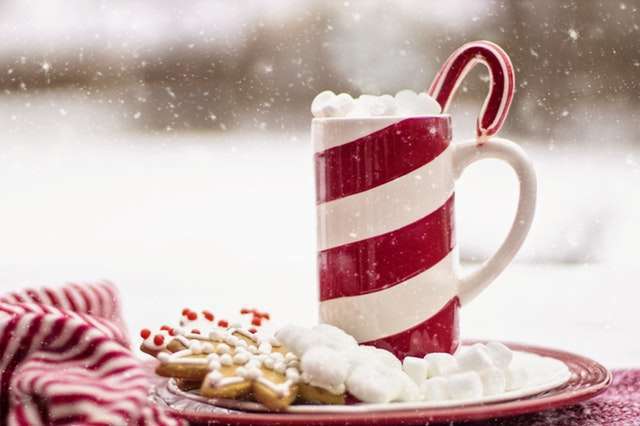 For candy cane messes on the carpet, pour a cup of tepid water on the area and let it sit for up to an hour. Carefully scrape the candy from the carpet with the back side of a butter knife or a spoon. When the solid piece(s) of candy is removed remove as much remaining water as possible with a clean white towel. If you have color left behind in the carpet mix up a few drops of hand dish soap and water and gently blot on the stain to remove then rinse with plain water and dry as much as possible. It’s not everybody’s holiday favorite, but it is still a popular treat. If you are an eggnog lover that has spilled begin by cleaning the stain by simply blotting up as much as you can with a clean white cloth or plain paper towel. For eggnog on the carpet, use a small amount of nail polish remover on a cloth to dab on the area until the eggnog has lifted away. No need to rinse as nail polish remover evaporates pretty quickly. To remove eggnog from clothing pre-soak in water and vinegar or an enzyme detergent before washing. They add a beautiful warm and festive glow (and happy memory inducing scents) to any room, but spilled wax can be tricky. With the right tricks cleaning dripped wax isn’t as bad as it seems. For any dried on dripped wax on any surface you want to begin cleaning it by freezing it. Grab a zip top bag and some ice cubes. Place the ice cubes in the bag, seal it, and place it on the wax. Once the wax is good and frozen gently chip it off with a dull object like the edge of a spoon. If there is remaining residue cover the stain with a piece of a brown paper bag or a newspaper and run an iron on a low setting over it, the paper should absorb the rest of the wax. There is nothing like a real live Christmas tree, the smell, the beauty, the fun of going to get it, etc. Live trees do sometimes leak sap that ends up on your tree skirt, carpet, or other flooring. To remove sap from carpet and cloth grab some rubbing alcohol and a clean white rag. If you have not spot treated the item with rubbing alcohol before you will want to do a test treatment on a small unseen area first, for carpet this could be inside a closet or in a corner. Once you know it is safe to use, apply some alcohol to the cloth and blot the sap. Continue blotting with re-moistened un-used sections of the cloth until the sap is gone. Need help with holiday stains that just won’t budge or want to deep clean your home’s surfaces before the holidays? Make an appointment online with All Kleen. We provide professional carpet cleaning in Mukilteo and surrounding areas as well as hardwood, tile, natural stone, and upholstery cleaning.